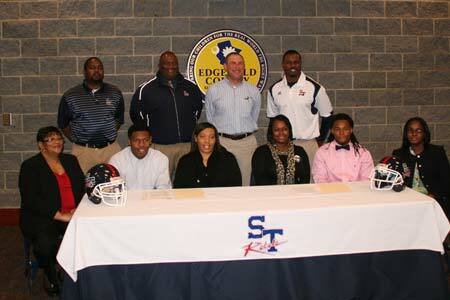 Strom Thurmond seniors sign scholarship papers Wednesday. Kenyatta Dunbar, on the left, signed football scholarship papers for Gardner-Webb and Jauveer Hammond signed to play for The Citadel. Joining the young men for the ceremony were family members and coaches. Included in the large crowd gathered at the Strom Thurmond Athletic Field House were teachers, classmates and a large contingent of Citadel Alumni.